Comfortably holds small-med pets up to: 13 lbs and 13” high at the shoulder plus a couple of pounds of gear. 15 lbs total. The Sport Cruiser features the EZ click, yet dependable handlebar bracket for fast and simple removal and attachment. FITS ALL STYLES of handlebars! Never leave pet unattended or alone in the basket while bike is resting on a kickstand. CAUTION: Never leave animals confined and unattended in direct sunlight, without ample ventilation or where there is a risk of overheating. Be sure to secure your pet with the harness. PLEASE RIDE RESPONSIBLY! Riders should always wear an ANSY/ASTMY/SNELL approved helmet. Do not ride when wet outside. Do not ride at night. Read the bike and Pet Cruiser owners manual before riding. Conduct pre-ride check before riding. Check on local bike laws before riding. Do not exceed 15 lb weight capacity limit. Do not install safety straps in way that will interfere with brake cables, brake levers, gear control shifters. Ride safely! For Ages 13 and Up. This new innovative portable bicycle basket allows you another opportunity to spend time with your best friend, cruising down the road in fashionable comfort, and style. 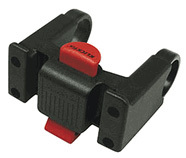 Snaps-on in seconds to all handlebar styles with our new 3.5” nylon quick click positive locking connectors. Secures to handlebars with patented quick click connector that fits all bikes, loaded with useful pockets and doubles as a portable pet carrier! The brightly colored sport basket is deep enough to comfortably fit pets up to 13 lbs. and 13” at the shoulders. Lots of roomy storage space in three cargo pockets for both you and your pet’s travel necessities. Safely accommodates up to 15 lbs total with your pet and gear. Weighs in at less than 5 lbs. and collapses in down to 3” for easy transport and storage. • A stabilizer bar under the basket supports unit from rubbing against the front tire. Washable: Hand wash with mild soap and warm water. 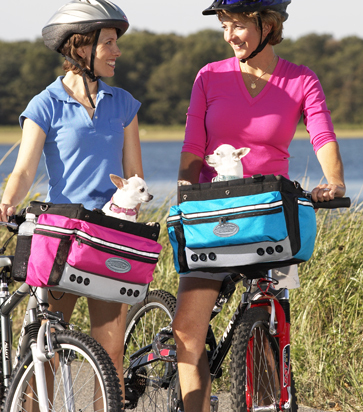 The Pet Cruiser sport bike basket is available in four hot fashion colors: Pink, Blue, Lime and Silver. • Comfortably holds small-med pets up to: 13 lbs and 13” at the shoulder and a couple of pounds of gear.